Visual Lottery Analyser introduces a new way of showing the inside of lottery games: Game Layout View. Game Layout View is a graphical representation of game numbers and the game itself in general. In this and in a few following topics you will learn how the layout of a lottery game is build and what elements include. 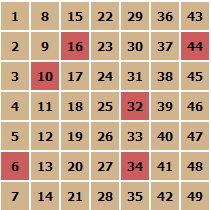 Let's review a sample lottery game like Lotto 6/49 where 6 balls are drawn from 49 numbers. 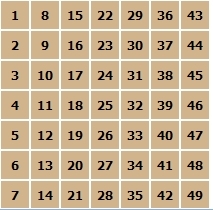 We can see a game as square field of numbers. We can place them on our ticket view and use color to mark them out. Looks better! How to see how the new drawing numbers are relating to the previous ones? Also not too much to say about their relations. 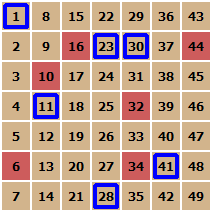 We can place new numbers on the top of the old ones and also use color to mark them out. We use blue border to indicate new numbers. There are more things to discover and this is just the beginning.